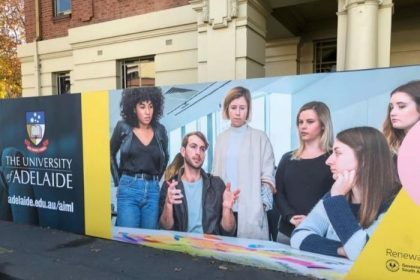 The University of Adelaide is distancing itself from an outdoor campaign that has been accused of ‘mansplaining’ after if featured a young chap apparently explaining something to five of his fellow students. The ad appeared on hoardings outside the old Royal Adelaide Hospital (RAH) and featured the image and the university’s logo. ‘Mansplaining’ is now a widely used term to refer to a man explaining something to a woman in a way that is considered patronising, condescending or didn’t need explaining in the first place. But uni bosses have quickly distanced themselves from the ad, saying it was erected by a government department known as Renewal SA and did not depict actual students at the university.